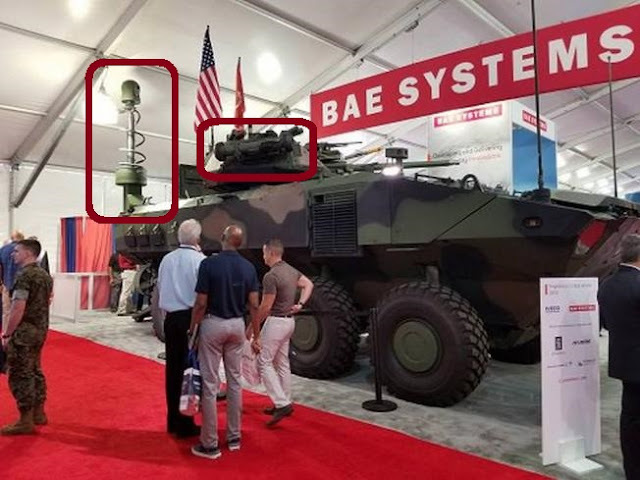 He said that the Marine Corps has already ‘turned on’ BAE Systems to start development of the command and control variant and that the company expected to begin efforts on the other two variants in 2019. 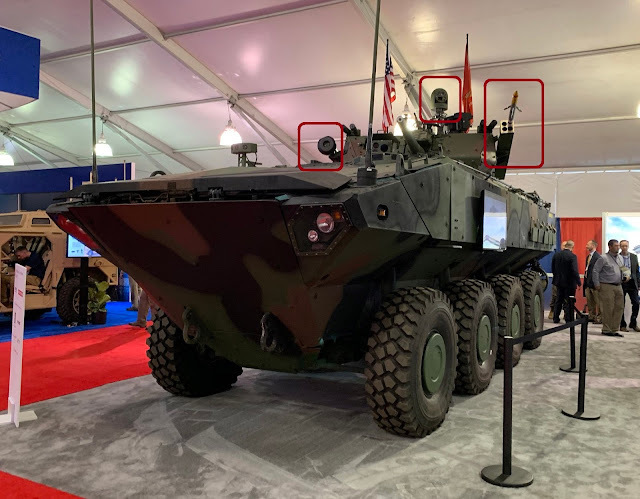 This year’s ACV gun variant exhibit at Modern Day Marine retained four of the interior work stations that had been installed for last year’s command and control display with two stations removed to allow for the installation of a Kongsberg 30mm (Mk 44) unmanned turret. Lacaillade characterised the ACV platform as ‘turret agnostic,’ noting that BAE Systems will be working with the marine corps to choose which turret is best for this platform. In addition to the 30mm cannon, the demonstrator platform turret featured a Javelin missile on one side and Advanced Precision Kill Weapon System on the other side. The design also features a mast-mounted Lockheed Martin Gyrocam, and integrated inputs from FLIR ‘Black Hornet’ UAS. ‘Essentially what we tried to do is take what is a good base ACV platform and show the marine corps that any “bells and whistles” they might want to hang on it we are capable of doing it,’ Lacaillade said. In the pics above I highlighted "the options available" that many of my eagle eyed readers pointed out. The Corps has slow walked the ACV but they are moving with speed and investigating the possibilities now. Additionally the package that BAE demonstrated is VERY formidable. Amazingly enough for a service that has NEVER had an IFV, the gun is the least noteworthy addition. APKWS rockets? Javelin missiles? Mast mounted gyrocam? Even a freaking UAS? Not to mention a 30mm cannon? This thing is bordering on action toy! If you're not thrilled then you're not paying attention.